One-on-one, real-time tutoring via chat and audio for students in grades K-12, entry-level college, and adult learners in a variety of subjects. Tutor.com is available 24/7 but live tutoring is only available from 2 pm - midnight daily. For technical support, please contact librarysupport@tutor.com or visit Tutor.com’s help center located at the bottom of each page in the Tutor.com FAQ section. Tutor.com cannot help you retrieve your PIN If you forgot your PIN you must contact a KCLS library or Ask KCLS for help. Video tutorials for students and parents are available on the SBAC. Full-text articles from a wide range of 19th century newspapers. Full-text journals, and reference sources from over 14,000 titles. Interactive museum tours, views of masterworks at brushstroke level detail, and tools to share your own collection online. Biographical sketches and magazine articles focusing on nearly 275,000 individuals. Articles, illustrations, definitions, and weblinks. For technical support, please contact edsupport@eb.com or 1-800-621-3900, ext. 7160. Articles, illustrations, definitions, and weblinks for young adults. For technical support, please contact edsupport@eb.com or 1-800-621-3900, ext. 7160. Websites to help with college and career exploration, financial aid, and scholarships have moved to the Teens page. Follow the direct link above or look for the resources- along with events and tips for using the library to prepare for school and job success- in a new 'Life After High School' section on the Teens page. Country and state reports, articles, maps, videos, statistics and data, photographs, biographies, interviews, and recipes- all focusing on world cultures. For technical support, please contact 1-800-889-3358 or tsupport@proquest.com, or visit ProQuest’s support page. Articles, maps, charts, primary documents, and teacher lesson plans; all focusing on daily life in world cultures. For technical support, please contact 1-800-368-6868 or techsupport@ABC-CLIO.com. Practice driving tests for cars, motorcycles, and the CDL in English and Spanish; VIN decoder tool (find it in the footer at the bottom of any page on Driving-Tests.org) identifies a car's manufacturer, brand, make and model, body style, engine size, assembly plant, and model year using data from the National Highway Traffic Safety Administration. K-12 and University level full-text articles, photos, maps, video, and transcripts from magazines, newspapers, radio and television news programs, and reference books about people, places, historical events, literary genres/authors/literary criticism, current events and more. Offers “Research Topics” to help guide research. For technical support, please contact 1-800-889-3358 or tsupport@proquest.com, or visit ProQuest’s support page. Non-fiction reference materials on a variety of subjects can be read in your browser, emailed, and printed. Business Plans Handbook sample business plans from entrepreneurs seeking funding for small businesses in the manufacturing, retail, and service industries. College Blue Book guide to thousands of 2 and 4-year colleges and the programs offered. Financial aid sources such as scholarships, fellowships, and loans. Statistics from thousands of sources including population, migration, health, income, consumer spending, manufacturing, elections, crime, and more. Full-text articles, primary sources, maps, historical journals, multimedia, study units, and history guides covering ancient times through present-day. For technical support, please contact 1-800-889-3358 or tsupport@proquest.com, or visit ProQuest’s support page. Language learning lessons with reading/writing/listening components. For technical support, please contact 1-877-626-4611 or visit Mango’s support page. Articles from the New York Times (1980-present). Tip: To see the most current complete articles, do an "Advanced Search," search by publication date and specific date range (enter the current date - current date), and select "Full Text" only. For technical support, please contact 1-800-889-3358 or tsupport@proquest.com, or visit ProQuest’s support page. Articles from New York Daily Times (1851-1857) and New York Times (1857-to three years before current year). For technical support, please contact 1-800-889-3358 or tsupport@proquest.com, or visit ProQuest’s support page. Full-text articles from a wide range of historical newspapers. For technical support, please contact AccessCS@newspaperarchive.com. If this service is not fully accessible to you, please contact Ask KCLS to discuss alternate options. Articles, topic overviews, statistics, primary documents, and web links on current events and popular debate subjects. Language-learning lessons for 100 languages including American Sign Language. English language learning in 63 languages. Build your own personalized courses based on your interests, occupation, learning goals, and available time. Includes courses for children and any of 60 occupations, as well as citizenship preparation courses. To track your progress, create a pronunciator account in addition to logging in with your KCLS library card and PIN. A quick start tutorial is available. For technical support, please contact support@pronunciator.com 24/7 or 1-800-328-1776 during business hours, or visit pronunciator's help center. Clases para aprender 100 idiomas incluyendo inglés en 63 idiomas base y el lenguaje de signos americano. Crea tus propios cursos personalizados según tus intereses personales, ocupación, objetivos de aprendizaje y tiempo disponible. Incluye cursos para niños, 60 ocupaciones, así como cursos de preparación para la ciudadanía. Para rastrear tu progreso, crea una cuenta de Pronunciator además de iniciar una sesión con tu tarjeta de la biblioteca KCLS y tu PIN. Un tutorial de inicio rápido está disponible. Para soporte técnico, contáctese con support@pronunciator.com 24/7 o 1-800-328-1776 durante el horario comercial, o visite el centro de ayuda de pronunciator. Over 150,000 full-text literary works of poetry, prose, and drama, plus literary criticism, essays, author biographies, reviews, and interviews. Includes the Poets on Screen library with over 800 poems read by contemporary poets reading their own or favorite classic poems. For technical support, please contact 1-800-889-3358 or tsupport@proquest.com, or visit ProQuest’s support page. Articles on a diverse range of topics from 5000+ magazines, journals, and newspapers including The New Yorker, The Economist, ABI Business Trade & Industry Articles (ABI/Inform), The Chicago Tribune, Los Angeles Times, US Newsstream, and US West Newsstand. Includes the CBS 60 Minutes Video Collection. For technical support, please contact 1-800-889-3358 or tsupport@proquest.com, or visit ProQuest’s support page. Access to Resume Builder will cease on July 31. Resume building software, sample cover letters and resumes, and job seeking tips. Sign up for a free account with your KCLS library card. For technical support, contact 1-800-822-3522 ext.135, jgalindo@individualsoftware.com and mgallegos@individualsoftware.com. The product KCLS uses is Resume Maker Web Pro v. 6.0. For technical support, please do not use the vendor online support/ticket system as it is only for retail (not library) products. Articles for K-8 on STEM, opposing viewpoints, animals, reading, language arts, current events, science, social studies, history, health, and technology from over 2,200 sources. Includes fully downloadable ebooks by grade or subject under “Non-Fiction” books. Integrates with Google Docs and Classroom and includes citations. For technical support, please contact 1-800-889-3358 or tsupport@proquest.com, or visit ProQuest’s support page. 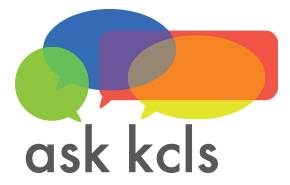 Access to all of the online resources that KCLS offers with a Student Account connected to your student ID. Test preparation (eBooks and interactive practice for civil service, military, and academic admissions exams), school search, career exploration tools, and resume builder. Tutorías individualizadas en tiempo real via chat para estudiantes de K-12, de nivel inicial universitario y estudiantes adultos en varias materias. Tutor.com está disponible 24/7 pero las tutorías individualizadas solo están disponibles de 2 pm - medianoche. • preparación para el test SBAC (Smarter Balanced Assessment Consortium) del estado de Washington. (seleccione "Otras herramientas" (“Other Tools”) en la parte superior del menú del sitio Tutor.com y "Preparación para SBAC" (“Prep for the SBAC"). Para obtener asistencia técnica, contacte librarysupport@tutor.com o visite el centro de ayuda de Tutor.com en la parte inferior de cada página de Tutor.com, en la sección Preguntas frecuentes (FAQ). Tenga en cuenta que Tutor.com no puede ayudarle a recuperar su número clave (PIN). Si olvidó su número clave (PIN), debe comunicarse con una biblioteca de KCLS o solicitar ayuda de Ask KCLS.